The battle between camera phones and mid-range digital compacts is set to hot-up with the launch of the worldu2019s first 5MP camera phone with a 3x optical zoom. The battle between camera phones and mid-range digital compacts is set to hot-up with the launch of the world?s first 5MP camera phone with a 3x optical zoom. Touted as the ?photographer?s choice? the Samsung G800 is due in the UK next month, boasting face detection, an image stabiliser and ?wide dynamic range?. Also on board is a Xenon flash, panoramic mode and video capability and, if they choose to, photographers can use the phone to browse the internet. Market analysts GfK Marketing Services told Amateur Photographer that it is currently looking into the potential threat posed by such phones to the mid-range digital compact arena. Steve Reid, GfK?s IT & Imaging senior account manager, said there is still growth in the 5MP digital compact market. Commenting on the launch of its new phone, Samsung?s Telecommunication Network president Geesung Choi said: ?As the multi-megapixel camera phone becomes more and more popular the needs of [sic] actual digital camera-like features grow. 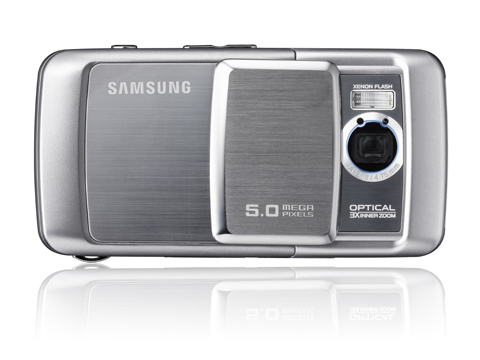 Samsung will satisfy the unmet needs in the camera category with a true digital camera-like design and functionality.? The G800?s features include a ?mosaic? and image editor functions. Measuring 101×51.1×18.8mm it accepts microSD memory cards and is PictBridge and Bluetooth compatible. Samsung would not release a price, telling us that it will be up to retailers to set this. It will be free when bought as part of a contract. A UK spokesperson added: ?It is not really aimed at the pre-pay market. ?